If you do a Google search on how to get the most juice out of a citrus, you’ll find several “lifehack” articles suggesting various tricks. Some methods do make sense (at least in theory), some are quite weird – one ‘lifehack” wants you to microwave the fruit before juicing it! The most common tip though is the one suggesting that you should roll the fruit on the countertop before slicing it. By doing so, you supposedly break the membranes that hold the juice hence, you end up having more of the good stuff when you squeeze it. 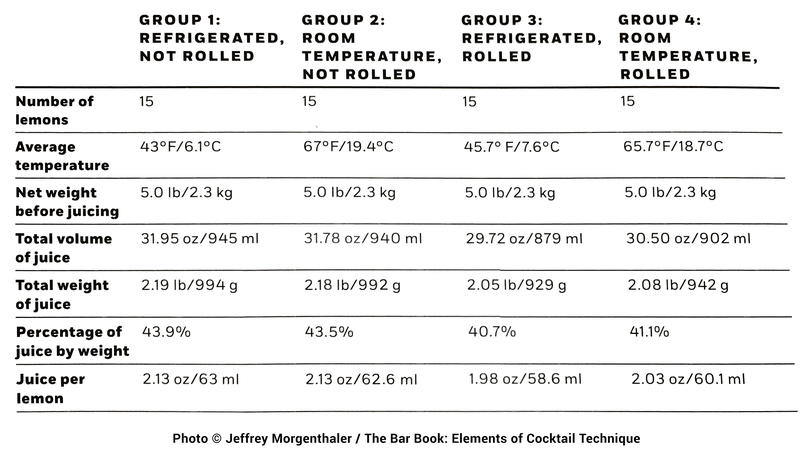 I was about to go and buy some limes and put these claims to the test, but then i remembered Jeffrey Morgenthaler’s The Bar Book: Elements of Cocktail Technique (an amazingly cool book for both aspiring bartenders and home enthusiasts like myself). In it, 2016’s America’s Bartender of the Year does just that – he investigates all these options one by one. And the results are rather surprising. Tap here for full size picture. There’s absolutely no need to make that extra effort and roll your citrus before juicing them – keep them fresher, colder, save some time and have better results by simply… refrigerating them. BONUS FACT: The average lime will yield about 1oz of juice (30ml), the average lemon about 1.5oz (45ml) and the average orange about 3oz (90ml) of juice. Why So Many Spanish Sport Clubs Have ‘Real’ As Part Of Their Name?